What happened to The Big Garage? During the 1960’s and 70’s, we old Wulfrunians seemed to be forever mourning the continuing loss of our Victorian and Edwardian buildings. This old depot’s facade made a silent departure. But the mutilation of the former Tram depot another casualty on Cleveland Road seemed to pass by unnoticed. Opened for the tram system in 1902 there were extensions for buses and trolleybuses in 1913, 1921, and 1932, but the depot remained with its distinct tramway style entrances until 1977. 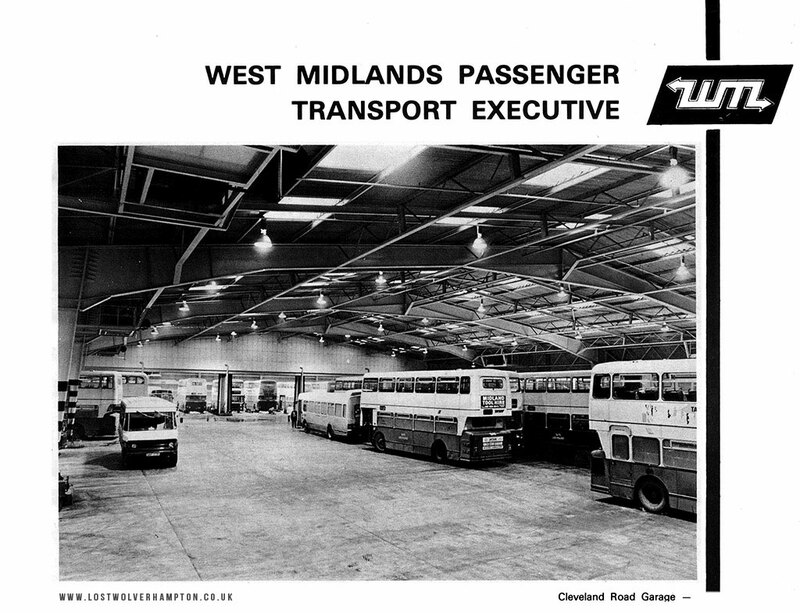 Cleveland Road Garage and other assets of the former Wolverhampton Corporation Transport Department were transferred to the West Midlands Passenger Executive in 1969. 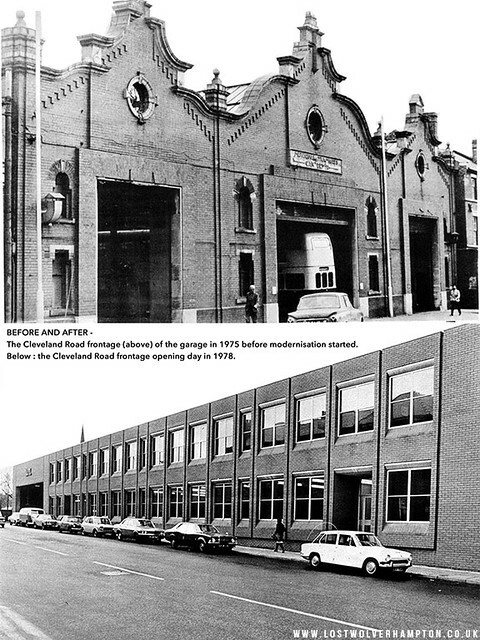 It soon became apparent that the garage, two adjacent buildings on levels that differed by ten feet, was unsuitable and inadequate for modern and large – scale bus fleet operations. The upper building fronted Cleveland Road the lower faced on to Bilston Street. Old offices were found to have been built on piers over a network of ‘catacombs’ some arched and some domed. These had to be penetrated to a depth of fifteen feet to provide solid foundations. All buses now come into the garage by the Cleveland Road entrance and pass through fueling, oiling, and watering services before deployment to any part of its upper and lower levels for parking and maintenance. The major part of the new garage is of portal frame design. It is 5 metres high at the sides and 8.7 meters at its centre. Its roof, spanning an area of 6,400 square metres is one of the biggest in the Midlands without centre supports. With side support columns kept to a minimum, there is an easy passage for buses. In the two-storey administration block fronting Cleveland Street, are the engineering, traffic and administrative departments. Union officials also have their own accommodation within the garage. Included in the block’s safety and security precautions are shot-gun proof screens for staff working in the area where cash is handled. The right place – The wrong time? Every solution creates problems and who would have that the inner ring- road made to reduce the towns foreseen traffic problems in the 1950’s. Would itself bring about the demise of our new bus depot after just 15 years by isolating Cleveland Road from the town centre? 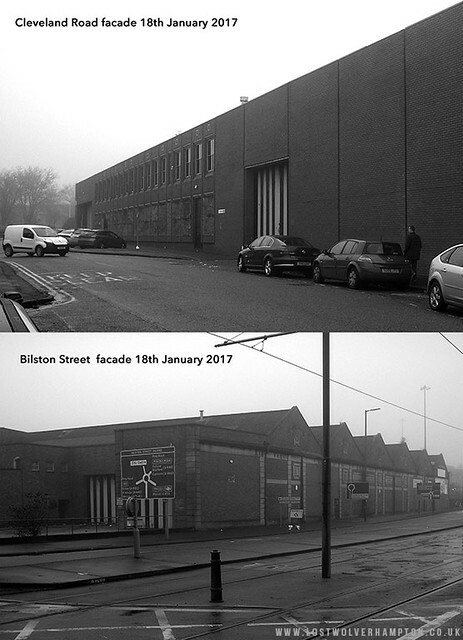 On the 1st of November 1993, all operations were transferred to other garages the majority going to Park Lane, Fallings Park Wolverhampton. Did no one consider the Ring-Road? And now in the year 2017, the old former tram depot is boarded up. Plans have been submitted to demolish it and re-develop the site with new housing.